Kayleigh Greer from Stevenage, Hertfordshire, spent three long years being disappointed by the ‘blue’ cabinet which didn’t quite match the grey and silver colour scheme of her bedroom. The 35-year-old mum-of-three bought the drawer unit from B&Q in 2016, having already asked staff if there were any other colours to choose from. Resigned to her choice, Kayleigh couldn’t help but feel a little ‘blue’ herself as she brought the cabinet home. Fast forward three years and Kayleigh was doing a deep clean of the bedroom she shares with her husband Darren, 48. 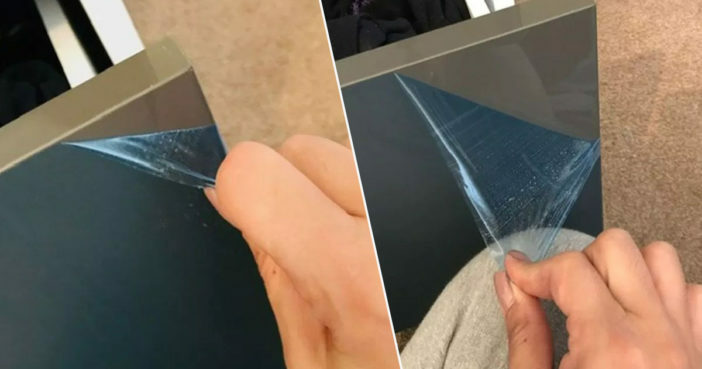 It was then that she began to peel away the protective blue film, discovering a much more suitable grey shade underneath. I never had any suspicions the blue colour was a protective film. I knew there was white tape along the top of each drawer which I thought was protection and would eventually need pulling off. Then I was deep cleaning the bedroom the other day and I was down near the cabinet vacuuming and I thought ‘while I’m down here, I may as well finally peel off the tape’. But as I started to peel, I noticed the blue film had lifted and I panicked and thought I had ruined unit. But I just kept peeling and it kept coming off. Underneath it was a really nice grey. It looks amazing. Darren was shocked when Kayleigh came downstairs with her arms full of blue plastic wrapping, and rushed upstairs to see what his wife had been up to. Darren was downstairs with the kids and I came down with all this blue film scrunched up in my arms. He asked me where it had come from and when I told him it had come from the cabinet he burst out laughing before rushing upstairs to see what I’d done. He thinks it’s amazing. He prefers the cabinet now to before. My mum did this with a fridge. The couple are now delighted that the cabinet looks like a brand new piece of furniture. It matches perfectly with their existing decor and has given them a mini home makeover without the price tag.